In the steppes of eastern and central Asia, the Campbell's Russian Dwarf Hamster enjoys digging burrows, which may extend up to three feet underground. These burrows are commonly lined with scavenged sheep's wool and dry grasses. The burrows maintain an average temperature of 62 degrees Fahrenheit (16°C). In captivity, 69 to 72 degrees Fahrenheit (20 to 22°C) provides a comfortable environment. Natural predators include various owls, foxes, falcons, and weasels. Many types of housing are available at pet stores, however the best option is an aquarium with a wire mesh top. 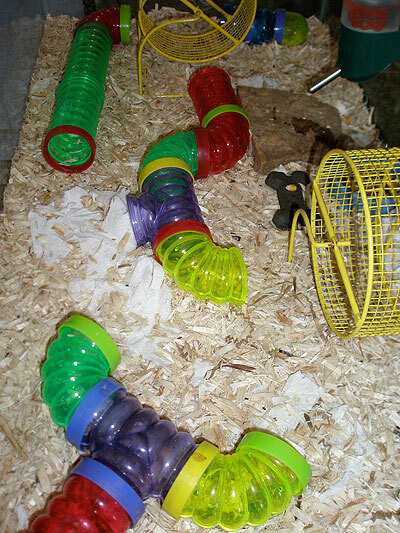 Plastic enclosures can retain hamster waste fumes, causing respiratory problems. Wire cages often have openings large enough for these tiny hamsters to squeeze through. When choosing an aquarium, the larger the aquarium, the better. Many books and websites mention 10 gallon aquariums since they are inexpensive, but for even 1 hamster, the space provided is too small. The picture on the right is a 40 gallon (breeder) aquarium. One running wheel per hamster is provided to reduce possible aggression. This size of aquarium allows for the hamsters to use the wheels or even run around the aquarium, which is common behavior that can be observed. The volume of the aquarium is not as important as the footprint. Measure the length and width to see how many square inches/centimeters your hamsters will have available. Check on craigslist for used so you can get a large enough aquarium for a low price. Since we believe in the most humane treatment of hamsters, and other animals, we feel that PETA's guidelines are a good starting point for providing a humane habitat for your hamster. "In their natural habitat, they prefer to be alone and are nocturnal so bonding with humans can be a challenge since they do not like to be awakened during the day. But evenings and early mornings are a good time to try to make friends. A 2-foot-square wire-mesh [or aquarium] cage with a solid base would be the minimum size for a home for one hamster, but keeping more than one hamster in a space that size will likely lead to a deadly fight. Those colorful plastic cages may be enticing, but they are difficult to clean, and hamsters may chew their way out. You’ll need a water bottle, nonwood-based bedding such as straw or shredded white paper, chew toys, and an exercise wheel. Wooden ladders and toilet paper rolls also make great toys," says PETA's website. These guidelines certainly do not accept that a 10-gallon aquarium as enough room for even one hamster. Books and other websites that mention 10-gallon aquariums are not taking humane treatment into consideration. We urge you to provide your hamsters with the most humane environment possible. In captivity as pets, the smallness of this animal precludes the use of heavily-scented wood-based cage-litters such as pine or cedar, the former of which can lead to itching, sneezing and even severe allergic reaction and the later of which may lead to death. Catlitter makes a good alternative. Paper-based beddings are encouraged, with aspen shavings usually now being regarded as the only safe wood-based choice. When setting up the habitat, be sure to add enough bedding to allow your hamsters to burrow below the surface (see picture to the right). 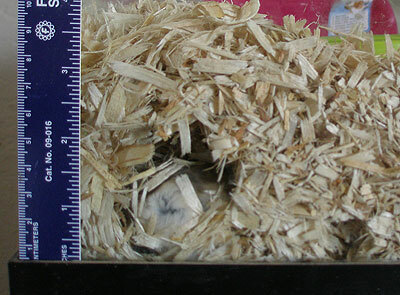 A depth of 3 inches (~8 cm) or more provides sufficient space for your hamsters to create their own cozy nest underground. Commercial "fluffy" beddings, usually made of cotton or similar material, have come under some controversy as possibly being damaging to stomach or intestines if swallowed. While paper-based or aspen bedding is used to give the hamster burrowing opportunities while providing odor control, plain toilet tissue is recommended as a nesting material to be used in addition to the "ground cover" of bedding. Notice the toilet tissue on the bottom of the hamster habitat on the right. Multiple owners find that the use of bathing sand is helpful. Chinchilla bathing sand can be found in most pet stores, although bathing dust is too fine and can thus cause resperitory problems. Bathing sand helps in improving coat and restoring oils in the fur. Bathing a hamster in water is not encouraged, as it is unhealthy for their skin and water removes needed oils. Without those oils any hamster could die easily from cold. To adopt a Campbell's Russian Dwarf Hamster, check with your local shelter or rescue group first. Just like cats and dogs, you can rescue a hamster that needs a home and have one of the cutest pets available. Hamsters prefer dark places. Dwarf hamsters also can run extremely quickly. Remember to check craigslist.org and local classifieds for inexpensive aquariums and other supplies. Call or visit your local animal shelter to inquire about rescuing a hamster.